So yeah, the most recent Dragonball movie sold a healthy amount in the US: 24,589 DVDs and 62,146 BDs (including BD/DVD combo packs), for a total of 86,735 copies. 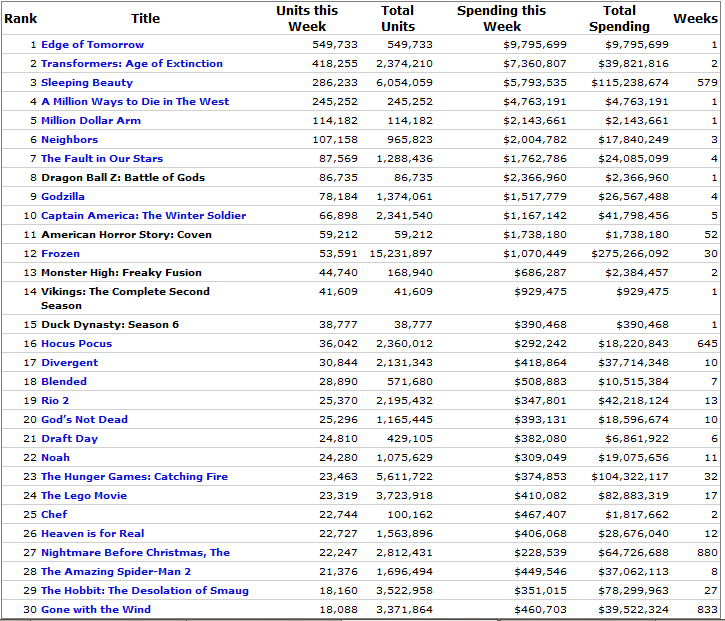 Even if it doesn’t immediately top the US totals of the series’ older movies, that’s quite a lot. For example, it’s over ten times that of One Piece Film Z’s first week total. To reiterate, that’s a huge number there, possibly large enough to have a second week and definitely large enough to sandblast parts of my still-in-development formula (which pegged it as closer to 20,000 in likely first-week sales). Best guess at this point is that some combination of being a movie, ranking extremely highly for an anime release, and being from the most popular anime franchise the US has ever seen pushed it closer to the storefront-heavy curve for mainstream movies, as opposed to the amazon-heavy curve other anime releases have seemed to follow. At any rate, screencap after the jump (original chart here while it lasts).